The philosophy of the company is simply to offer quality products with a neat and essential design, extremely functional and simple to use. 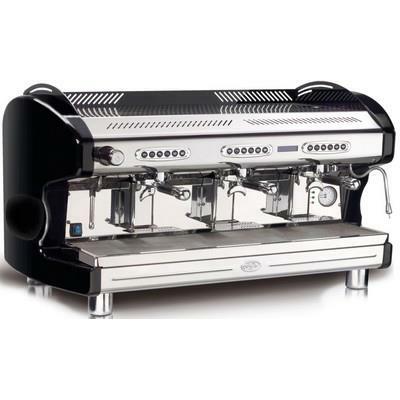 As a consequence we only use extremely reliable electronics for our products because that a coffee machine must give its user an excellent espresso or cappuccino at the simple touch of a button. Therefore the machine must have all required functions in order to obtain the desired beverage. We think to have reached good results with our series made completely of metal, with preheated cups, with the possibility to regulate the grinding and the dosing of the coffee and the water (mechanically and/or electronically), but our objective is to continuously improve our quality in order to give to our customers an always increasingly reliable product. Another fundamental requisite for a coffee machine is to produce a coffee at an optimal temperature and to maintain its fragrance and taste. With our products are reliable, as the operating temperature is reached in a very short time (40-50 seconds), on the other hand there is never stagnant water in the system and every beverage is made from fresh water.